Nylon stockings, being inspected, in 1954. Nylon is an artificial fibre. It is one of the most commonly used polyamides, and was first used on February 28, 1935. Nylon makes a silky material which was first used in toothbrushes. It is strong, hard and water resistant. It is used to make clothes. In fact, polyamides are most used for synthetic fibres in clothing. Nylon can also be used to make other materials, such as parachutes, ropes, string for tyres, carpets, fishing nets and cloth and socks. 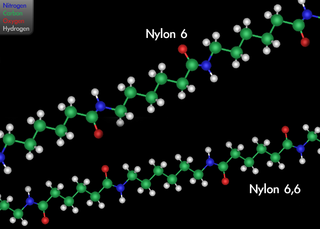 Nylon was invented by Wallace Carothers at Du-Pont. This page was last changed on 1 March 2019, at 21:37.